There are certain musics that seem to reach back into the distant reaches of human consciousness: didgeridoo music of Arnhem Land, the vocal harmonies of the Central African Pygmy, witchcraft music of Tanzania, Kirana ragas from North India and Pakistan come immediately to mind. These are ancient forms carried through the generations on the carpet of the oral tradition. Though feeble attempts have been made, these traditions defy intellectual analysis. This makes sense when we realize that these musics are pre-intellectual; pre-rational is a better term. Modern analysis (post-Renaissance) is based upon a process of dissection, abstraction, and quantification. As soon as this method is applied to ancient music, as soon as it is codified, notated, and filtered through the Western scientific mind, the music itself crumbles. Its continued existence relies upon the fact that all of our experience travels through the vestigial realms of past consciousness. As much as we would all like to think of ourselves as rational creatures, we are equally mythical and magical; our moment to moment coming into being, upon close inspection, is just as mystifying as it must have been to the first cell, the first molecule, the first subatomic particle – the Big Bang creation myth is as fraught with miracles as any other. Modern musical instruments have all evolved from the same materials: skin, bone, wood, gut, and voice. So one wonders what ancient memory is stored in ice. What fragility, loneliness, and incalculable beauty is stored in the solidified molecules of the very stuff upon which life depends? 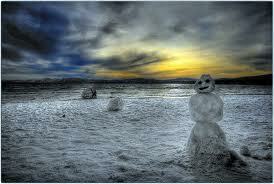 I have distinct memories of trudging home from grade school at dusk, the snow knee-high. Cold, dark, quiet. There was a distinct sound as the snowflakes hit my face, my feet breaking the smooth surface of the snow; something ominous about the muffled sound of a car moving past; something very eerie about the half-finished snowman in the big corner lot. Everything became so still. But it was a haunted, pregnant stillness – a feeling that the trees, despite appearing quite lifeless, merely had their eyes closed. 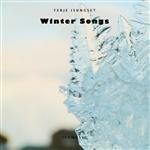 Terje Isungset’s music evokes a time and a place at once so mysterious and so familiar. All the sounds are created upon instruments carved from ice. The pieces are improvised and recorded in structures made of ice – igloos and glaciers. Yet, despite the incredible “technology” involved in the construction of the music, what strikes the listener is the transcendence of music into a sonic experience of our earthbound mythology. The cavernous resonance emanated by centuries of frozen history, the fragility of instruments whose very magic lies in the nature of transience, and the human voice- the ephemerality of which is so deeply embedded in breath – spiritus. Isunget’s music does not tell us a myth, it involves us in the actual living of myth. The ability to mythologize is not the ability to tell stories, it is the ability to create meaning from that which will forever remain a mystery – existence. Yes, Isungset’s music is deeply beautiful, richly evocative, highly original; but allow it to work upon your spirit and you may find your self changed, not transformed but deepened. You may recover something ancestral, something that puts you in touch with the natural world in all its mystery, delicacy, and inherent evanescence. By the time you read this sentence, the present moment is gone. The stuff of philosophy is wonder. The stuff of music is soul. Great art finds the place in between.